It is a therapeutic method combined both ¨art and play¨ developed by Dora Kalff, a Jungian therapist, in Switzerland in the 1950s and ’60s based on her studies at the C.G. Jung Institute, Zurich, in Tibetan Buddhism, and with Margaret Lowenfeld, in England. 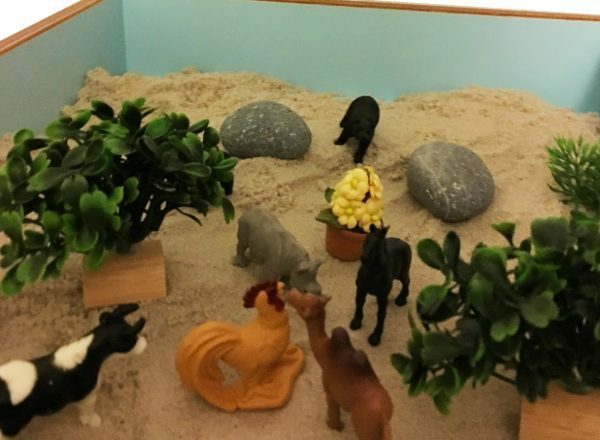 In sandplay therapy, the client is given the possibility, by means of figures and the arrangement of the sand in the area bounded by the sandbox, to set up a world corresponding to his or her inner state. In this manner, through free, creative play, unconscious processes are made visible in a three-dimensional form and a pictorial world comparable to the dream experience. Through a series of images that take shape in this way, the process of individuation described by C. G. Jung is stimulated and brought to fruition. If you find it is difficult to explain what is going on in your mind verbally, you can use sandplay therapy to free yourself from the words and consciousness. You can use the sand and figures to create a world of your own. You can present the inner self by creation, imagination and whatever you feel like. There is no judgement and no need to be artistic. I would work with you to analyze the sand trays you create and use it as a channel to know yourself more and to start the self development process. Through the sessions, you will find yourself being closer to your own psyche. Sandplay therapy is a combination of art therapy and play therapy, which is a very good method for adults to relax from daily stresses and to connect with your own self in order to heal the trauma and to develop. Who can take sandplay therapy? Kids can use the sand, water and figures to present their inner situations without the ability to talk as an adult in a meaningful way. 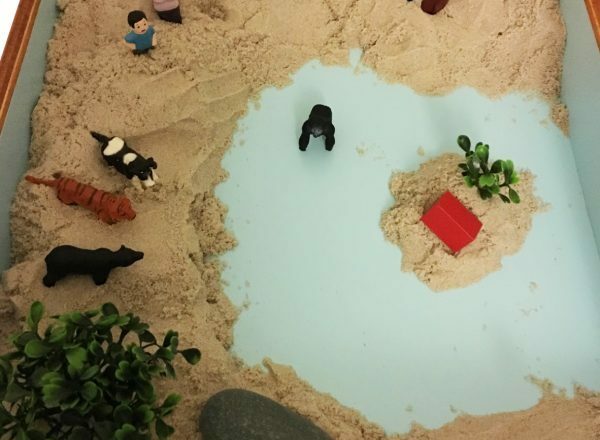 The sandplay therapy can help the kids to release the stress and the traumas by experiencing the possibility to ¨Be themselves¨ and ¨be accepted by the adult (psychotherapist, me)¨. When the kids start to feel safe and encouraged to present themselves during the sandplay, they will have more inner strength to heal the trauma and to develop the healthy ego and self. I work with the kids to create the sandplgy trays and to practice to talk about the trays verbally. Also, I will have time to talk with main caretakers to understand the kids by trays analysis after each session. It is a useful development process for kids with psychological issues and emotional disturbances. I have started to learn sandplay therapy from 2003 during my PhD training at Kyushu University Japan. We have one large play therapy room full of toys, gymnastic equipments and sandplay box with countless figures around it. Sandplay therapy is one major therapy used for children since it is a combination of play and creative process. When children and adults start to touch the wet sands and look through the figures of human beings, fairytales, animals, natural objects, man made objects and etc, they have begun a journey to express themselves both consciously and unconsciously in this amazing space. I use the sandbox (W４５０mm × D３６０mm × H７０mm) with figures of family (human beings), houses, tress, flowers, animals and stones. It is the approach to use Family Image Test and Landscape Montage Technique in a sandbox setting. So people can represent the inner images of self, family and environment in their own way. To analyze and appreciate the whole process is an meaningful psychotherapy for both children and adults.